Though the 2018 season has officially come to a close, Seahawk Maven reporter Corbin Smith will continue to periodically tackle your pressing Seahawks questions throughout the offseason! 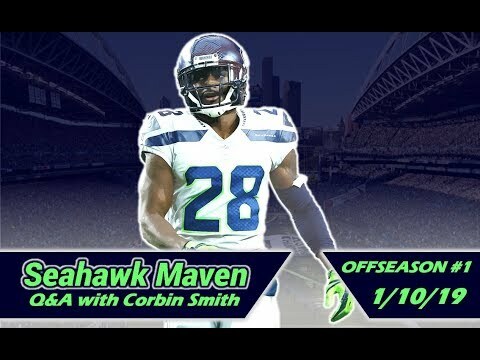 In our first offseason Q&A session, Corbin discusses the future of the Seahawks after a surprising 10-win season, elaborates on why critics have been a bit harsh towards offensive coordinator Brian Schottenheimer, lists off a few intriguing first-round options for April’s NFL Draft, breaks down free agency options, and much more! Thanks for the questions and keep ’em coming! Have you considered doing live streams where viewers can message you questions or suggestions they'd like to see the Hawks do? Do u think Seattle would sign Malik Jackson from Jaguars? There comes a point when you have to question why they refuse to allow Wilson to go out there and win the game, especially when he and the receivers were working well with limited opportunity. The Seahawk game plan was predictable and their commitment to the run boarders on maladjusted. Is this whole run thing they have going, some sort of new slant of the "Emperor's New Clothes" fable and nobody is game to tell Pete? They currently have one of the best QBs in the league and couldn't balance shyte on a shovel! Do you think they will be bring Bo Scarborough back next season? Also what are your thoughts on Isiah Simmons of Clemson in the form of Cam Chancellor? Collin Johnson WR out of Texas needs to be a priority 3rd rd or late 2nd rd draft pick. The presence alone would complement doug and lockett freeing them from top corner duties or vice versa. Need a big body possession receiver that can catch in the middle of the field. Is there a good FG Kicker coming from the College Ranks? Had a thought that's probably nonsense but…Russell Wilson grew up a saints fan. What if he wants to wait in an extension to see if the saints win the Superbowl and Brees retires? Long shot but it crossed my mind. « Shaquem and Shaquill Griffin give defensive tips for NFL playoff teams | Get Up! Real Hawk Talk Episode 60: What will Seahawks do with their picks? How Does The Frank Clark Trade Affect The Kansas City Chiefs NFL Draft Plans? REACTING TO SEAHAWKS VS PATRIOTS! Superbowl!! 1993 Seattle Seahawks Team Season Highlights "Back On Track"
FIRST THINGS FIRST | Does acquuiring Frank from Seahawks make Chiefs Super Bowl favorite? [DEBATE] Does acquiring Frank Clark from Seahawks make the Chiefs the SB favorite? First Things First |Does acquiring Frank Clark Seahawks make the Chiefs the Super Bowl favorite?